By using this website and placing an order at The Magic Mushroom Gallery you certify that you are at least 18 years of age. This website, with all its contents, is intended solely for consenting adults. By placing an order at The Magic Mushroom Gallery you accept all responsibilities regarding the legality of the products that will be shipped to you. All products on our website are legal in The Netherlands. However, we cannot and will not make any claims about the legal status of any product in any other country, because it is impossible for us to keep up with the continually changing laws in every country. We cannot provide any information on the legal status of a product in your country, so please do not ask us. The list of countries for which shipping is restricted, provided on each product page, is to be considered non-exhaustive; no claims can be made based on this information. You accept the responsibility to inform yourself about your local laws, import and custom regulations before ordering and you certify that the import to your country of the products ordered is legal. We do not encourage the illegal use of our products. We strongly advise you to consult your lawyer, if you have any doubts. 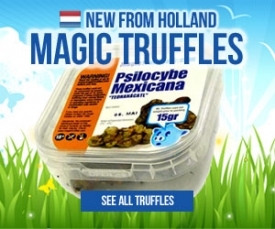 The Magic Mushroom Gallery makes no claim that the information and products on the website are available, appropriate or legal outside The Netherlands. All information provided by The Magic Mushroom Gallery, through this website, links to or from other websites or by its employees over the phone, email or any other transmission is purely for educational and informational purposes. This should never be interpreted as a recommendation to undertake a specific action. Using the information for illegal activities is at your own risk. The Magic Mushroom Gallery does not warrant that the information on the website is up-to-date or accurate. The Magic Mushroom Gallery makes no claim that our products are suitable for treating any disease, to cure, diagnose an illness or prevent diseases. The Magic Mushroom Gallery does not provide any specific medical advice. Do not take our products if you have a high blood pressure, heart disease, diabetes or any other health problem. Do not take our products if you're pregnant, nursing, taking MAO inhibitors, medicines or any other (prescription) drug. Do not drive or operate heavy machinery while using our products. If you have any doubts, always ask your doctor and follow his advice. Our products have to be kept out of the reach of children. You're taking full liability for personal injury, damages, punitive measures, lost profit or revenues, loss of use of product or equipment and any loss of property that may result from the purchase, ingestion, use or misuse of any product from The Magic Mushroom Gallery. The Magic Mushroom Gallery, its owners, agents and employees cannot be held responsible for the actions of its customers. This website uses tracking cookies to store certain settings, without which the webshop wouldn't function. Statistics on website usage are also tracked but you are able to opt out. All illustrations, pictures, design, text and logos on this website are copyrighted. Redistribution, retransmission, republication, or any commercial use of any of these contents is strictly prohibited without the written permission of The Magic Mushroom Gallery. All rights reserved.